The North Spoon - Christmas Tree Farm : Christmas Trees in the rain! Growing up, I would dream with my dad about what our "ranch" might be called one day...we would talk about what if we 'hit it big' and we landed a ranch ( a farm), what would we call this place? One day, without hesitation, my dad looked across the truck as we drove down the gravel driveway to feed our horses, and proclaimed to me he knew exactly what we would call our dream ranch: The North Spoon. That day, a name was born and a memory was planted within a young man's heart. I'm not sure if my dad was fishing for a title, sufficing the dreams of his son, or dreaming of what might be for himself....but one thing we know: we never forgot the name. When Olivia and I felt the prompting from the Lord to seek out land, we began praying about what 'this place' would be like and what we hoped for. It wasn't long and we felt this impression in our hearts to consider starting a Christmas Tree farm! There's a cross-story here where another dear family in our community had taken us in as friends and were big fans of Young Life and it's mission. Through the process of watching God provide a small farm for our family, our affinity for raising up Christmas trees and serving our community continued to rise. One day, I discussed this with the late Steve Lockett, and how we felt like whenever they were ready to get out of the Christmas tree business, we would have an interest in getting in! He only encouraged our involvement even more so! As time went by, and Steve went to be with the Lord, the Lockett family had learned of our desire. They began helping us with resources in the tree business and some quality counsel along the way (still much to learn). The outcome of this long time friendship with our family and the Lockett family at Buttermilk Farms has been deep friendship, shared memories and the onset of The North Spoon Christmas Tree Farm at our home and small farm along with a second location - we are continuing a long tradition of Norway Spruce Christmas trees at Buttermilk Farms! We felt like with the birth of our pipe dream come true, the extension of grace and tidings of joy from the Lockett family, we wanted to honor our friend and mentor, Steve Lockett. Each year we will open up the Christmas Tree season with 'opening weekend' at Buttermilk Farms for the Friday and Saturday after Thanksgiving to continue this long line of tradition. Bare with us as we re-grow some trees and re-establish a presence on that farm. Grow with us as we develop a new tradition at our home and show you our progress each year as we raise up White Pine, Virginia Pine, and Douglas Fir trees with some Norway Spruces mixed in! During the interim and more than likely over time, we will keep offering fresh cut Fraser Firs from the North Carolina Appalachias! All are welcome! Come on out for a Christmas Tree Farm experience: hayrides, hot chocolate, bonfires, our farm animals, and certainly Christmas Trees and Christmas wreaths for your family! 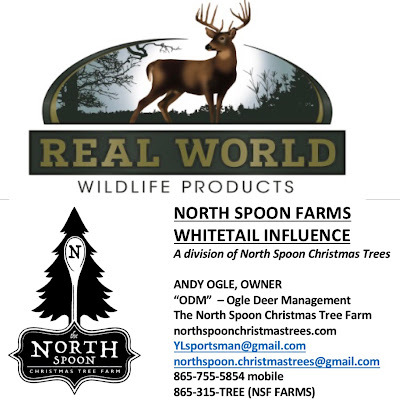 North Spoon Christmas Trees owned & operated by Andy & Olivia Ogle and their family. Christmas Trees in the rain! A few trees remaining - come & see us! We are open for your whitetail management needs by appointment - give us a call and we will be glad to set up a time to help you! If you would like to e-order your 2018 Family Christmas Tree, please click HERE ! THANKS FOR YOUR BUSINESS. Picture Window theme. Powered by Blogger.